As per European Union Parliament Regulation (EC) No 110/2008 — the rather important one that lays out the criteria for each type of spirit produced in the European Union — aquavit and gin have something rather unusual in common. They are both among a handful of spirits that by definition include the subjective character of taste. But it’s not merely the definitions that gin and aquavit have in common. First, both are botanical spirits where flavour is primarily the result of distillation in the presence of botanicals. Second, they both have their origins in medicinal tradition. Nicholas Culpeper, the 17th century herbalist, wrote in his 1652 book The English Physician that, “Indeed there is no better remedy for wind in any part of the body…than the chymical oil drawn from [juniper] berries.” But he spoke similarly of caraway as, “A most admirable remedy for those that are troubled by wind.” In a renaissance apothecary you may have been as equally likely to have been prescribed a distilled caraway water as you were a distilled juniper water; as likely to have been prescribed gin as you would aquavit. Given their shared history, it’s not much of a surprise that distillers of both often include the other’s signature botanicals. 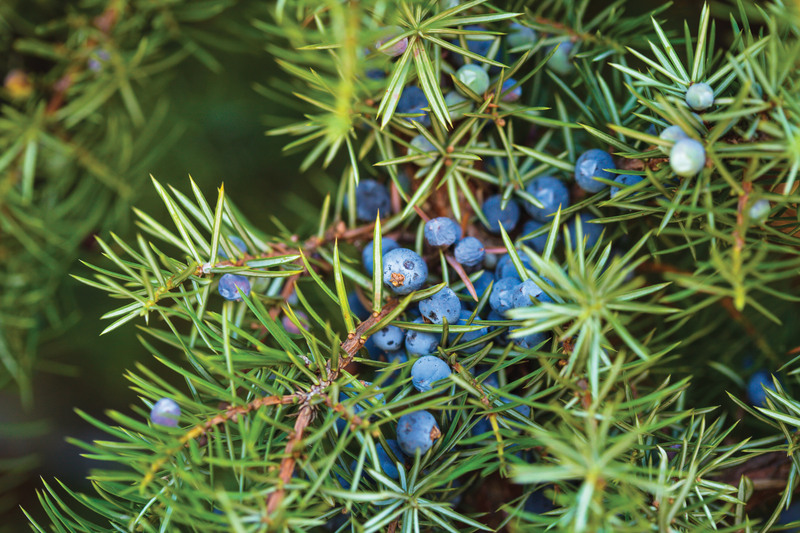 Juniper is sometimes seen as a supporting botanical in an aquavit. While dill is relatively rare in gin – caraway is wildly common and among the top 20 botanicals used (well, at least among distillers who disclose their botanical bills). While this is Gin Magazine, it’s worth taking a closer look at the place where these two traditions overlap. Anethum graveolens, or more plainly, dill, is a member of the same botanical family as angelica, anise, coriander, fennel, celery and caraway. A dill plant can grow up to about two feet in height and is best known for its feathery, frond-like leaves. Though the leaves are an important part of many European food cultures, it’s the seeds that are used by distillers of both aquavits and gins. to a woody and spicy compound known as dillapiole. When it all comes together, dill seed is a greener, slightly mintier tasting version of caraway. Caraway is rather simple as far as botanicals go. The seeds are primarily made up of only two molecules: carvone and limonene. Limonene is the primary flavour molecule in most citrus fruits. On its own it’s recognisable as the aroma of oranges. But it’s found as a secondary component of many gin botanicals including juniper and caraway. which smells more minty and while common in spearmint, is not a major part of the caraway aroma. Similar to many other plants, how a caraway seed tastes in a gin and aquavit is a product of its environment and how its grown. While distillers might look toward biennial caraway because of its higher oil content by volume – flavourwise the choice of source could be between a more citrus-forward version with a higher ratio of limonene to carvone and a heavier carvone-forward blend. So just because you see caraway among a gin’s botanical bill doesn’t mean that the flavour is simple and predictable. One study found that caraway seeds grown in Latvia had a nearly 4:1 ratio of carvone to limonene, while another study found that Hungarian-grown caraway was nearly equal in its ratio. With gin and aquavit a distiller can have an impact on flavour by carefully selecting source, in addition to merely choosing the botanical. In many gins that feature caraway, the tasting note can be quite loud owing to the solubility of its essential oils in ethanol. Furthermore, it’s within those gins that the line between gin and aquavit is blurred. New Columbia Distillers, based in Washington D.C., might blur the line most acutely, with their tongue-in-cheek Ginavit which features prominent notes of caraway, dill and juniper – along with a host of other botanicals to create a Christmas themed spirit that invoked the warmth of winter and the spices of European Christmas cookies. … and for good measure — gin and juniper are also a major influence on aquavit. It’s not rare to see juniper, coriander and other common gin botanicals included on the botanical bill of an aquavit. Spirits Aquavit Blend No. 01, Minions VänSkap Aquavit, Gamle Ode Holiday “jule” style Aquavit.